I can hardly believe it, but even though those hot summer days seem only like a few weeks past, It’s already time for my end-of-year annual update. For my now-traditional seasonal illustration, I’ve done something a little different this year, paying homage to my favourite Christmas film (and actually one of my favourite films, full stop), Frank Capra’s It’s a Wonderful Life. It would be a cool tribute to draw a scene from the film, and, or so I thought, would save me some valuable time. But as is always the case when I start working on something, things got a bit grandiose and unnecessarily complex pretty quickly. 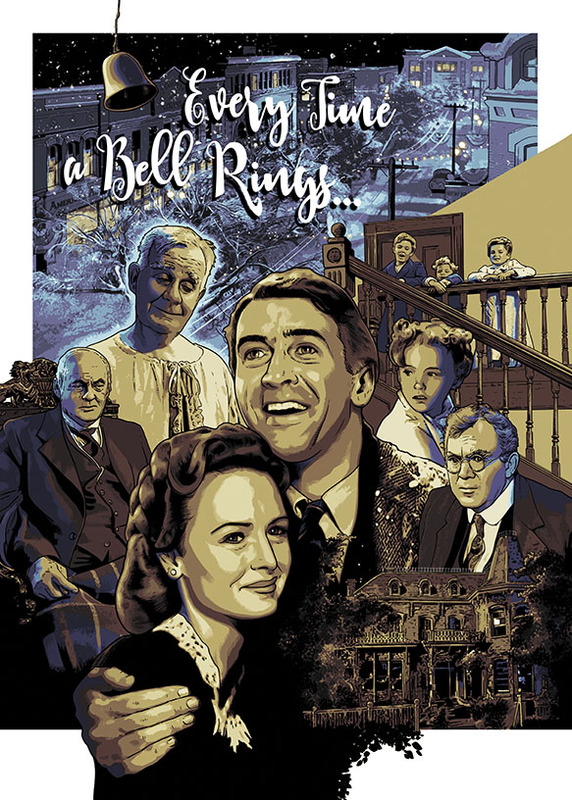 Maybe if people appear to like it, I may go full Mondo and make an art print available for next Christmas (assuming my online shop is actually up-and-running by then), even though Jimmy Stewart and Donna Reed probably don’t have the same selling power as Star Wars these days. The newest issue of Meanwhile…should be reaching comic stores and subscribers’ letterboxes early in the new year. Number eight contains the latest episode of Strangehaven of course, in which those cuddly Knights of the Golden Light return, a fragment of which you can see below. It’s a fab issue which also includes The Needleman, the first of a two-parter by the astonishingly good Martin Simpson, a new short by Darryl Cunningham and the usual continuing features by David Hines, Mark Stafford, Sarah Gordon and Ginny Skinner. As always, thank you for your continued support, it’s greatly appreciated. Wishing you a wonderful Christmas and a happy, healthy and successful 2018.